Casey Stoner continued his recent MotoGP revival with a brilliant last ditch overtake to deny Valentino Rossi a heroic podium on his return to action in Germany. Stoner and Rossi were locked in an engrossing battle for the most of the second part of the race, which was shortened to 21-laps after a three-rider pile-up forced out the red flags. Stoner, who fitted a used Bridgestone rear tyre for the restart, feared the worst as he came under intense pressure from a hard charging Rossi at the halfway stage. The Italian, back in action just six weeks after he broke his right leg, closed down a 1.9s deficit on Stoner and he first grabbed third on lap 15. What followed was an endless exchange of overtakes between the two, reminiscent of their titanic tussle at Laguna Seca in 2008. Stoner though was happier with the outcome on this occasion as he left it late to relegate Rossi to fourth. Rossi though he’d done enough to defend third as he rode a tight line at the penultimate corner. 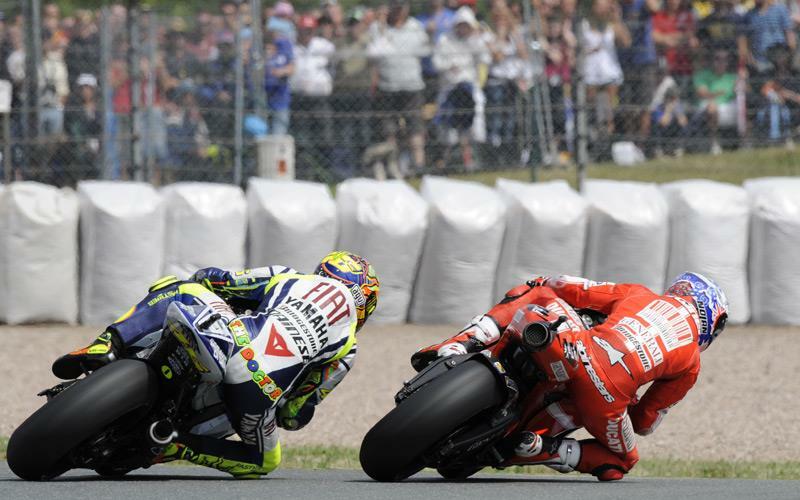 Stoner though ran a sweeping line on his factory Ducati GP10 and got excellent drive approaching the final corner. And he produced a brilliant block pass on Rossi to take his third successive third place by just 0.366s. The Australian said: “The end of the race was a really nice battle. At the start we could see that Valentino was able to run a little bit higher lap times than I was. I was pretty much at the limit and I was quite thankful for the crash. "Not thankful it happened obviously but it helped me more than some of the others I think. We felt in the first part I didn’t have a rear tyre that worked anywhere near as well as it had over the weekend, so we went with an old tyre that we’d used in qualifying and the grip was immediately better. "There was something wrong with that first tyre because I had no grip from lap one on the left side. The right was fine but on the left there was nothing and it was almost like using the hard compound. As soon as we changed it back to yesterday's tyre it felt like it had all weekend and I could run higher lap times. "I got a little bit held up behind Dovizioso and I tried everything I could to try and catch Jorge and Dani but I didn’t have the pace. As soon as Dani got in front the gap stretched out. "Valentino then started taking some big chunks out of me and when he came by I thought it was going to be a case of see you later. But I could stay with him and as soon as I felt comfortable I could make an overtake. "It was back and forth but at the last corner I was able to get the better of him. He went very tight at the bottom of the hill and I opted to try and get a better run on him and have a go at the last corner. Stoner denied his late success had exacted some revenge for his bitter ’08 defeat at Laguna Seca. Stoner crashed out in America after an enthralling tussle with Rossi but he said: “We’ve had plenty of nice battles. In these last three years I’ve had some fantastic races even in 2006 when he passed me and took off. "It is always about who is your greatest rival and for me it is all about who is strong on the day. We had a fantastic battle today with a lot of overtaking and we were able to run similar lap times.